A new water source will disrupt Djibouti’s source of iodine. IGN is working with partners to steer a course of action toward healthy iodine nutrition through iodized salt. In Djibouti, drastic national infrastructure changes are underway that will disrupt the country’s current source of iodine: drinking water. A pipeline is currently in development to channel water from Ethiopia to Djibouti in an effort to improve water quality, and as part of an overall push to modernize in Djibouti, a small country in the horn of Africa. While the new water pipeline is an important step toward sodium reduction, it means that a new long-term source of iodine is required to meet the population’s physiological iodine needs. In anticipation of these changes, IGN is working with partners in the field to establish iodine nutrition through Universal Salt Iodization (USI). USI programs are in place in over 150 countries throughout the world and have led to a steep decline in iodine deficiency across the globe. Due to these effective, affordable, sustainable programs, 75% of the global population is now protected from iodine deficiency . Water samples were collected across Djibouti in a small-scale survey to measure iodine concentration. Iodine is an essential mineral for human development, and iodine deficiency can lead to lifelong growth and cognitive impairments. 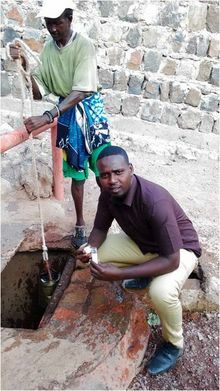 In Djibouti, new data from levels of iodine in urine, salt, and water together reveal that drinking water is Djibouti’s sole source of iodine. Water drawn from wells, public fountains and piped systems across the country has on average enough iodine content to meet half of the daily requirement with four glasses of water a day. Meanwhile, iodine is absent from salt. Currently, Djibouti’s population is not just meeting but exceeding the healthy level of iodine intake. (Median urinary iodine concentration in Djibouti is 325 micrograms/liter, just above the healthy range as defined by the World Health Organization. ) Investigators reached these conclusions from surveys carried out over the past two years, by IGN and partners including UNICEF, the Ministry of Health, and ETH Zurich. In Djibouti, perhaps the greatest challenge to establishing a salt iodization program comes from more visible and urgent health problems like acute malnutrition and infections disease, that take priority, according to Dr. Sagno from UNICEF and his colleague Salama Ismael Hersi, Nutrition Program Manager at the Ministry of Health. The challenge is to increase awareness of the “hidden effects” of iodine deficiency, according to Dr. Hussein. Healthy iodine nutrition can increase average IQ by as much as 13 points. The impact lasts a lifetime and ripples across entire communities, contributing to a population’s ability to thrive. 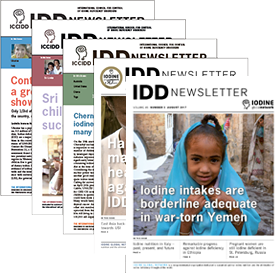 In March, following the decision to build the pipeline, the IGN and UNICEF met with policymakers to share the survey findings that revealed water to be Djibouti’s sole source of iodine. The Ministry of Health and IGN’s partners on the ground in Djibouti have committed to develop a strategy for iodine deficiency prevention, beginning with evaluating the new iodine situation once the pipeline is functional. Results will help policymakers continue to navigate the course of Djibouti’s national nutrition policy. Accelerating a USI program in Djibouti would be a sustainable and cost-effective solution.